We participated in our first software testers event, Testival (http://www.testival.eu/), held on the 1st and 2nd of September 2017, located in the Inovativni Zadar Incubator, Croatia. We were joined by colleagues from regional companies: Shoutem, GIS Cloud, Toptal, Infobip, Infinum, Degordian, Oradian, Repsly and many others. Testival is a unique “unconference” event. 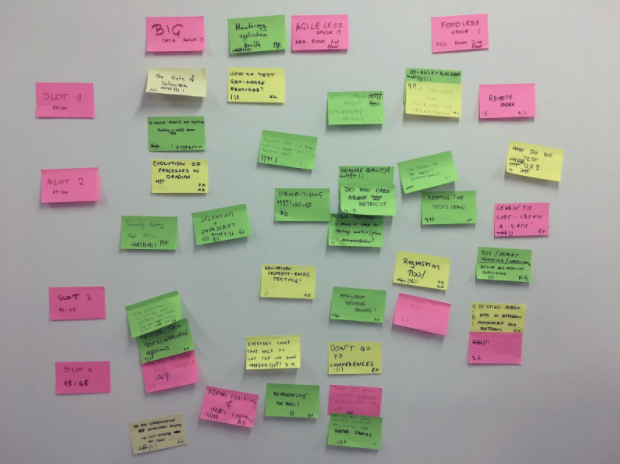 For those of you unfamiliar with the “unconference” format, simply put, it’s a loosely structured conference emphasizing the informal exchange of information and ideas between participants, rather than following a conventionally structured programme of events. The event is designed to gather testers from Croatia and surrounding areas, and, talk about software testing. It is organised once per year, with all resources, such as the venue, food, and materials financed entirely by the sponsors. There is no participation fee and interest for this event is increasing year on year. The first day was reserved for registration, suggesting topics for discussion, organising the agenda and finally, discussions based on the suggested topics. We ended the day with some social time between participants. Admittedly this picture does resemble a self-help group; but software testers can face tough and stressful challenges when poor quality work is passed our way! :) This was a very useful exercise as testers can sometimes feel their work is underestimated or perhaps not providing any value. The second day started early in the morning (considering it was a Saturday!).. 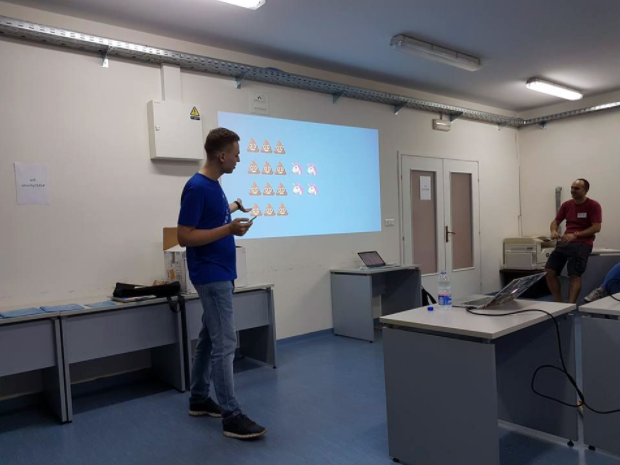 Alex Rodionov, one of the key note speakers, talked about “Testers Anxiety” and automation in software testing. We had the option to join in to any of the concurrent discussions and either directly participate or listen to the debate. There was a general consensus on what to discuss, which showed us that regardless of the software platform, language, code and target audience, we all run into the same problems. Some of the suggested topics were merged, such as: “Regression tools” and “Everyday tools that help to get the job done” and this allowed us to elaborate and cover more ground. 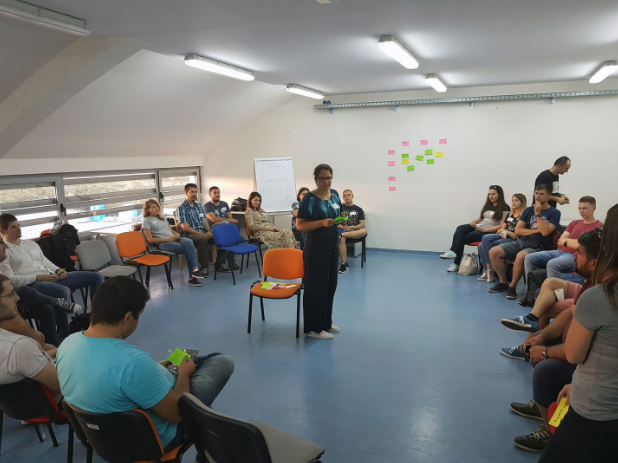 Other topics which gained the interest of bigger testing groups were, “The state of Selenium”, “How do we test UX”, “Communication between testers and developers”, “Bugs tracking and reporting” and “How to measure quality”. While speaking to other participants we discovered a varied approach to testing. From automated to manual, explorative to agile/scrum based, in-house teams and outsourced. We also discovered that testing can often be considered a secondary priority, and therefore given less attention. In response to that, we should all help promote test planning to project stakeholders, ensuring it is considered at the outset of any software development project and allocated adequate budget. The main goal of the test team is to help prevent mistakes (with test and behavioural driven development), detect defects and ensure we deliver the highest quality solutions and/or services to our customers and continue to do so as the project or product matures. The event closed with an “a-ha” moment: each participant spoke about the highlights of what they learnt during the event. We recognised that through our continued commitment and investment in testing, we are now better organised, having learnt from past experiences. Developers are sharing their knowledge with testers and vice-versa, which matches our company culture and the work we are proud of. We believe in our mission, which is to help you solve tomorrow’s challenges today, with testing being a major part of that. Many thanks to the founders and organisers of this event: (Irja Straus, Davor Banović, Karlo Šmid, Krešimir Linke, Željko Filipin) and we look forward to joining you next year with an even bigger test team! "We engaged Buckhill to support the development of our new hybrid mobile app. Buckhill's experience, expertise and adaptable approach enabled us to accelerate our learning and jointly deliver a great app that is now being used by our customers. If you're looking for a development partner then Buckhill are a great choice"
"Buckhill are an outstanding service supplier. They have considerable knowledge and experience which has enabled them to successfully undertake a number of complicated migrations and platform designs for us. They do what they say they're going to do when they say they’re going to do it and challenges are never problems. These qualities are rare." "The technical expertise within the team at Buckhill is far above any other company that we have dealt with, this means that we can always rely on Buckhill to provide the very best solution for any issues we have. We now treat Buckhill as part of the in-house team." "We are delighted with our choice of service provider, and have nothing but good things to say about Buckhill. They acted with a high level of professionalism and competence in all respects. We cannot recommend them highly enough." "Buckhill was able to bring a solution in a complex interoperability problem. I was often impressed by the level of their expertise and deep knowledge. When problems arose they were able to find creative solutions with an emphasis on reliability and security. I can say that during the whole project Buckhill was never the bottleneck, our success with this project is definitely due to Buckhill's talented team."